After the last post about the amazing food you can get everyday here in Surin I was thinking about what the top ten dishes might be, so I posted up on my Facebook, Twitter and Instagram about what dishes people loved and needless to say I got more than 10 different dishes!! Everyone knows what my favourite is but I know that other people like different things like the super spicy papaya salad or any of the fish dishes. So after looking at what everyone has told me and my own knowledge of Thai food I have finally put together this list of the Top Ten Thai Dishes, hopefully your favourite dish made the list!! 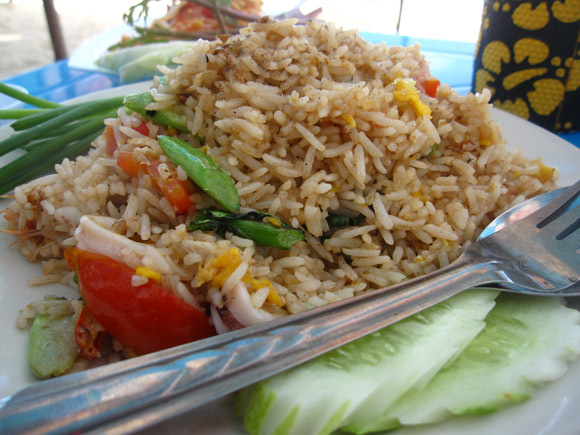 This dish was suggested by our own member of staff Dan, who works on our Koh Samui, Teach and Beach Project. 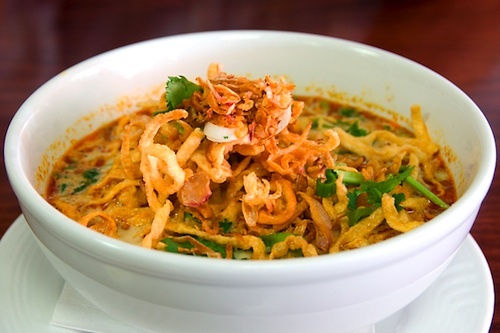 Khao Soi is a Burmese influenced dish that has two variations to it. The first is the Lao version which is a soup with noodles, pork, lots of veg, chilies and lime, the second is the Northern Thai version which is made with coconut milk, lots of lime, egg and noodles. Both are super tasty and can be made to the spice levels of your choosing. 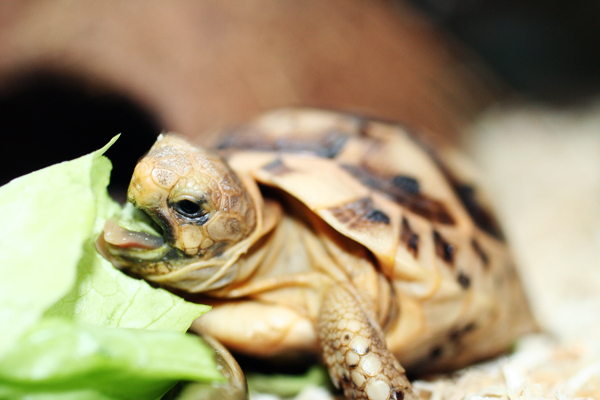 Lots of volunteers eat this dish on a regular basis due to it not being hot. 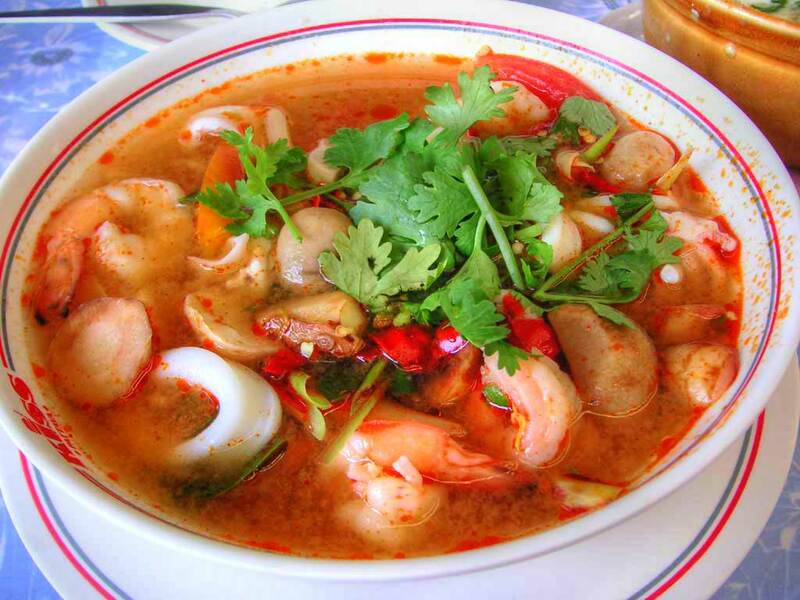 Newcomers to Thailand find that they can’t always deal with the level of heat found in Thai food so this is a great beginners meal that can have the spice level increased as you become more accustomed. The dish itself is made from stir fried chicken that is sweet and salty as is normally accompanied with mushrooms, carrot, soy sauce and a serving of rice; my tummy is already rumbling. 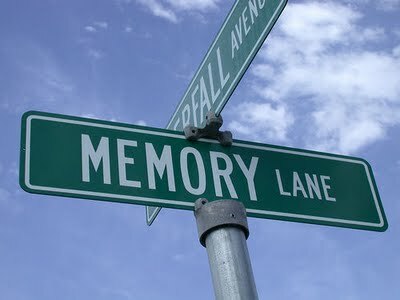 No it isn’t what you first thought; cheeky!! 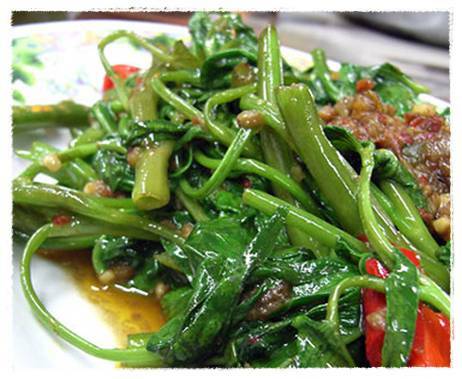 Morning Glory is a green vegetable that is found and enjoyed throughout Thailand. It is normally cooked with lots of garlic, birds eye chili and oyster sauce. Now I can’t take any heat, at all, and I can manage to eat this; the chili adds a flavour not heat to this side dish. 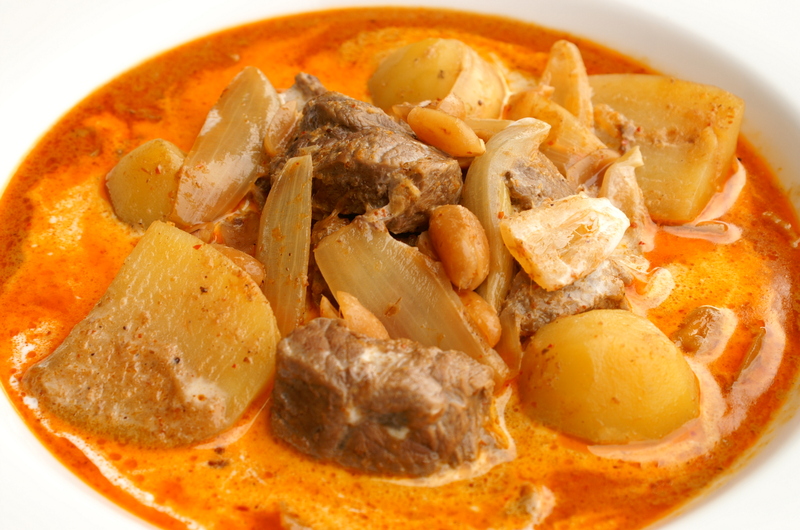 Massaman is a red Thai curry dish that is Muslim in its origin, this means that it is normally served with beef, duck or chicken, you can add pork to this dish but this is not what it was originally intended for as pork is not allowed to be consumed by Muslims. This curry dish is made with coconut milk, bay leaves, cinnamon and the massaman paste, it is normally accompanied by a serving of rice. If you are on the Elephant Project then Worn will cook you a beautiful chicken version of this at some point during your stay. 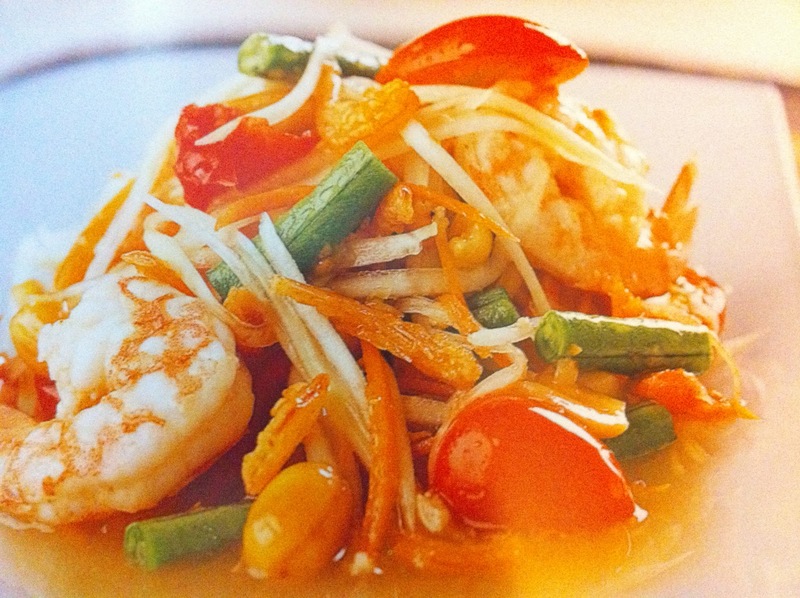 A dish that is originally from the North East of Thailand, Papaya Salad is not the feint hearted. It is the Thai version of Marmite, you either love it or you hate it. This is because of the incredible heat that the mountains of chilies used in this dish generate, it is also cooked with tomatoes, garlic and a little soy sauce. Believe me when I say that even Thai sweat when they eat this, I would recommend you try it if you think you can take the heat but make sure you have a bottle or seven of water on hand to try and cool your mouth down!! This is one of the most popular dishes in Thailand as is available all over the world due to its distinctive aroma and taste. It is made from lemon grass, chili, lime, mushrooms and shrimp; it is spicy so just prepare yourself for that haha It is most commonly eaten with rice but can be made with noodles as well, it is a very famous Thai dish and something you have to try at least once. The flavour is quintessentially Thai and something that will always remind you of your time in the Land of Smiles. Pad Thai is a Vietnamese in origin and was renamed Pad Thai when the 1930’s Thai Prime Minister, Luang Phibunsongkhram, re branded it in order to promote Thai nationalism and centralization, it was also pushed as a meal in order to reduce the heavy reliance on rice; Thailand’s number one export. 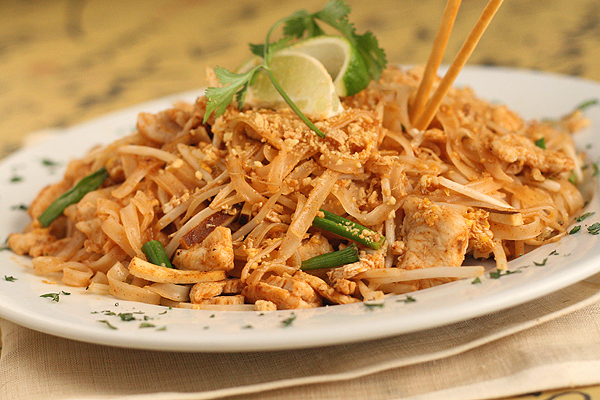 Pad Thai is one of Thailand’s oldest meals and is eaten by everyone, it is stir fried noodles, traditionally served with egg, fish sauce, bean sprouts, coriander and either chicken, shrimp or pork. 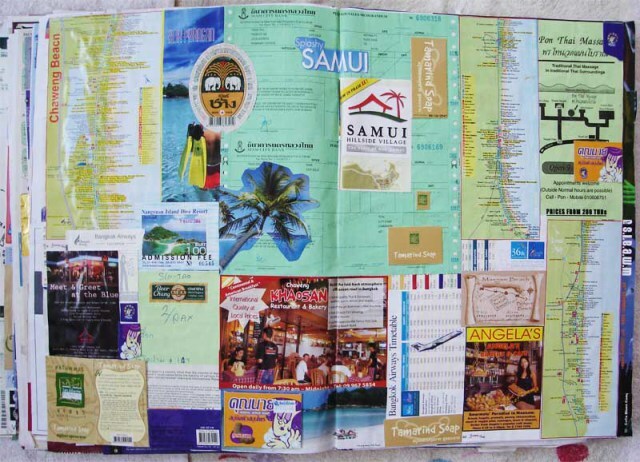 It is found all over Thailand from the street vendors on Khao San Road to some of the most expensive restaurants in Bangkok. 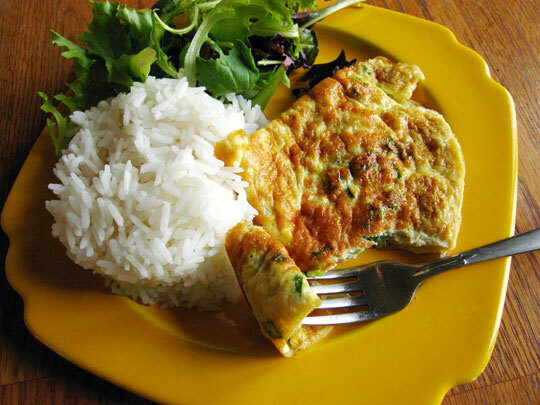 Thai omelette is one of the most amazing things I have ever eaten, it is so far and beyond omelette in the Western world. I don’t know whether it is the inclusion of tomatoes, onion, garlic, coriander and whatever meat you want or if it is just some Thai magic, but Kai Geo has quickly become a staple of volunteers, who often eat it as a meal in itself. 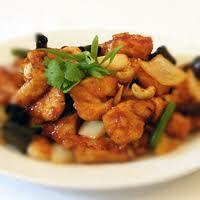 It is a great option for vegetarians as well as it contains lots of veg and spices but not always meat. I always get an omelette on top of rice dishes as I think it makes the dish more substantial and fills me up for the whole day. I have mentioned Goi Djab in previous posts and I always try to take each volunteer to try this amazing dish which is originally Chinese. 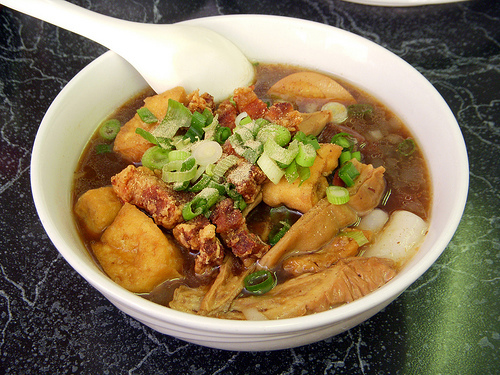 It is a thick noodle soup dish with large flat noodles, lots of garlic, beansprouts, fish sauce, egg and normally eaten with chicken sausage and pork on the bone. It is also great if you add crushed up, dried, chicken skin; I know this sounds gross but trust me, it is really good! Goi Djab is known as the hardest noodle dish to cook, which is why not many street vendors cook it, restaurants will sometimes have it on their menu but not always, so when you find somewhere that offers it, you should definitely snap it up. Now I know that fried rice isn’t the most imaginative choice for number one but after looking at what everyone on Facebook, Twitter and Instagram were saying it would seem that everyones favourite meal tended to have a base of fried rice, whether it be with shrimp, pork, chicken, beef or fish. This very simple and traditional Thai dish can be made into the King of all meals depending on what you put into it, you can add fruits, vegetables, meats and a whole array of spices and chilis and it will always fill your tummy and leave you feeling happy. As everyone knows, I eat Pineapple Rice everyday, it is beautiful and has such a wonderful blend of sweet pineapple with salty chicken and sour lime, you just can’t go wrong in my opinion. 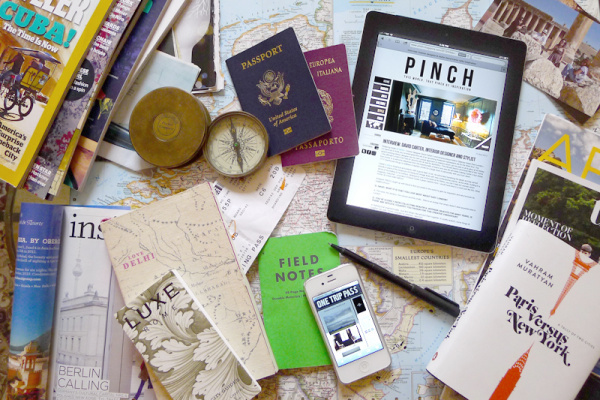 To get the oppertunity to try all of these beautiful dishes and more, then you need to get yourself over to Thailand! 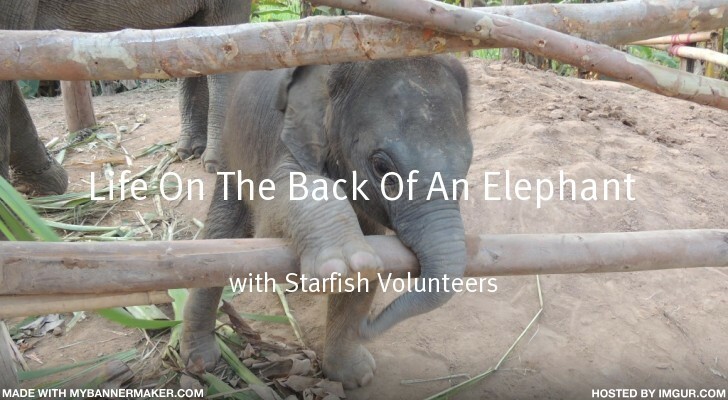 One of the best and most life changing ways of doing this is with volunteering, so take a second to check out the Starfish Website and the Starfish – Volunteer Thailand for what you can do, take a look at the Tumblr for a little inspiration.